At Hawthorne Hophouse in Portland, OR, patrons can order whatever’s new from several nearby breweries, perhaps discovering they love peppery saisons or tart krieks. But the 24 taps don’t end there, as there are fermentations from producers around the Northwest, all vying to create beverages locals might like. And locals like hops. So a dry-hopped number from Salem, OR, might not seem like an envelope-pusher until you realize it’s not a beer at all but a dry-hopped cider from Wandering Aengus Ciderworks. The keg kicked in about a week. It was followed by a brandy-cured strong cider from the new Two Towns Ciderhouse. It’s no wonder beer lovers are cottoning to artisan ciders, stoking a resurgence in hard ciders akin to the craft beer renaissance of decades past. Actually, for the record, don’t call it hard cider to folks in the industry. It’s cider. That “soft” stuff is juice. You don’t call grape juice wine. Apples from an orchard at Sea Cider, near Victoria, British Columbia. The TTB permit required for making fermented cider is the same that bonded wineries need. (The Bureau also does some bizarre differentiation when said cider contains more than 7 percent alcohol and/or any fruit besides apples or pears.) Yet it can be said that wine people don’t love fruit in general; they love grapes in particular. Most oeonophiles wouldn’t be caught dead sipping strawberry or elderberry wine, or even the mead (a.k.a. honey-wine) variety “pyment,” which contains both honey and grapes. 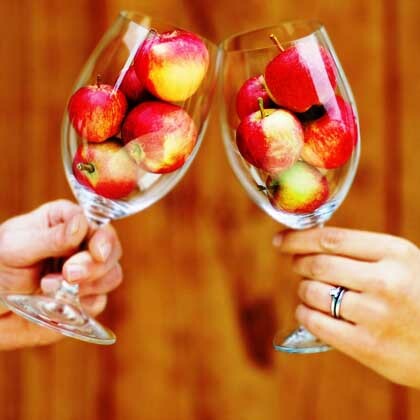 So while part of that crowd opens up to what is essentially sparkling (though sometimes still) apple wine, a good part of cider’s growth stems from gravitating beer lovers. Beer aficionados rightly revere hops the way vintners genuflect before grapes. Yet beer geeks (and their girlfriends)* seem to embrace many non-beer fermented beverages, mead notwithstanding, so long as they’re made artisanally (Zima-esque malt beverages need not apply). So, while cider’s nothing new—vastly predating the Norman conquest of England in 1066 credited as cider’s tipping point—more bottles of it are showing up at the collective beer table. Brian Yaeger lives in Portland, OR. Most commercially-available hard ciders actually don’t use hops (if they do use hops, they’ll make a point of saying so on the label). You’re good to go with brands like Strongbow, Doc’s, Samuel Smith’s, Farnum Hill, Crispin Brown’s Lane (or Crispin Honeycrisp), if you can find them (it really depends where you are located). Angry Orchard doesn’t use hops, but I don’t think it’s that good – look harder for the good stuff (and don’t get that Stella Artois cidre).